The ECB family of indoors wall-mounted ozone generators are global leaders in their performance class. The ECB ozone generators are designed for continuous operation in ambient air and utilize unique U.S. patented double dielectric barrier discharge technology. The ECB generators are designed for operation under remote control and feedback (by ozone detector) to establish a constant and stable ozone concentration inside the treated room. All ECB models comply with UL and CSA standarts,and come with safety features including a semi-automatic power circuit breaker, two differential pressure regulators and an interlock which shts off the generator if the enclosure door is open. The ozone output levels of the ECB generators are especially suited for applications requiring large treatment volumes. Typical application is the extension of shelf life-time of fruits, vegetables and flowers in cold storage rooms. 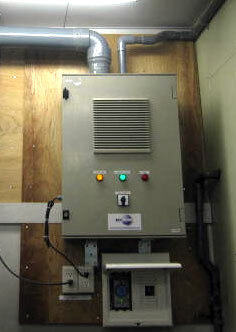 An Indoor model ECB-2 wall-mounted ozone generator installed in a service room of a large supermarket to discourage mice from entering.